Do you have an itty-bitty that you’re just itching to get started on a balance bike? You’re in luck! The Yedoo Too Too is a high-quality, BEAUTIFUL balance bike that fits even the tiniest riders. With features like Kenda pneumatic (air) tires, Tektro brakes, and a lightweight, durable steel frame, the Yedoo Too Too is a REAL bike for the children of bike enthusiasts. (Or for parents who just like making sure they get the best stuff for their kids). With a low standover height and a weight of just 8 pounds, we particularly like this balance bike for young toddlers (starting between 18 and 24 months old). If you’re like we were when our son was little, you’re basically chomping at the bit to get your kiddo on a balance bike. Who can wait until TWO?! That’s why we appreciate the Yeddoo Too Too. It is one the smaller balance bikes we’ve tested. The minimum seat height is 12″ which means that you’re child needs to have a minimum inseam of at LEAST that long. Most little ones will fit on the bike around 18 months old. We actually wanted to see how well it would fit on an itsy-bitsy, so we borrowed our friends’ TINY kiddo. Although she wasn’t yet able to scoot around by herself, she fit on the bike and LOVED having mom and dad push her around. I have no doubt she’ll be cruising in no time. The one thing we weren’t crazy about was the seat. It is pretty thick and bulky, and while it looks really cute and stylish, our little tester struggled with it. Bulky diapers and bulky seats don’t necessarily go well together. It also increases the required inseam since it is pretty thick. Our 3-year-old tester, it should be noted, had no issue with the seat so this is just a note for the 2 and under crowd. While this isn’t the bike we would recommend for the parent of a preschooler (it’s a small bike), don’t stress that it’s going to get outgrown too quickly either. The quill-style headset is adjustable so you can raise both the handlebars and seatpost as your child grows. 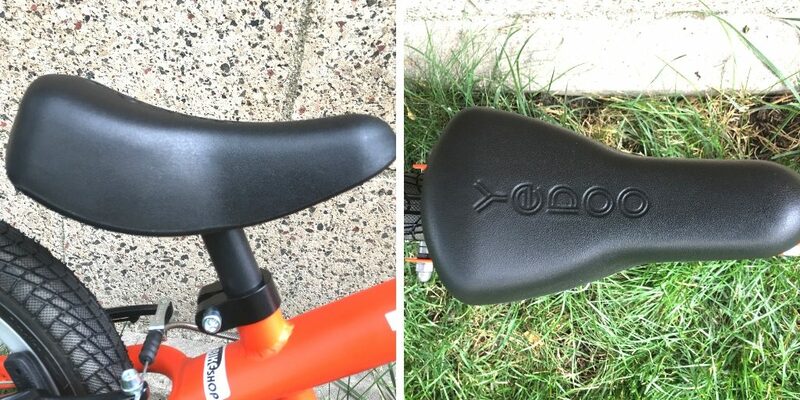 The seatpost has a maximum seat height of 18″ which means your kiddo can use it until they are about 4. Really, they can use it past that also–it will just be a bit silly. Even my 6-year-old had fun rolling around on the bike, and since the bike has a 110 lb weight limit, you really don’t have to worry about older siblings abusing the bike too. The other thing we really like about the bike as your child grows is the brake. Many balance bikes, like the ubiquitous Strider, don’t have a brake. While this is fine for very young toddlers, by the time kids are around 2.5 years old, they are usually able to start using a handbrake. 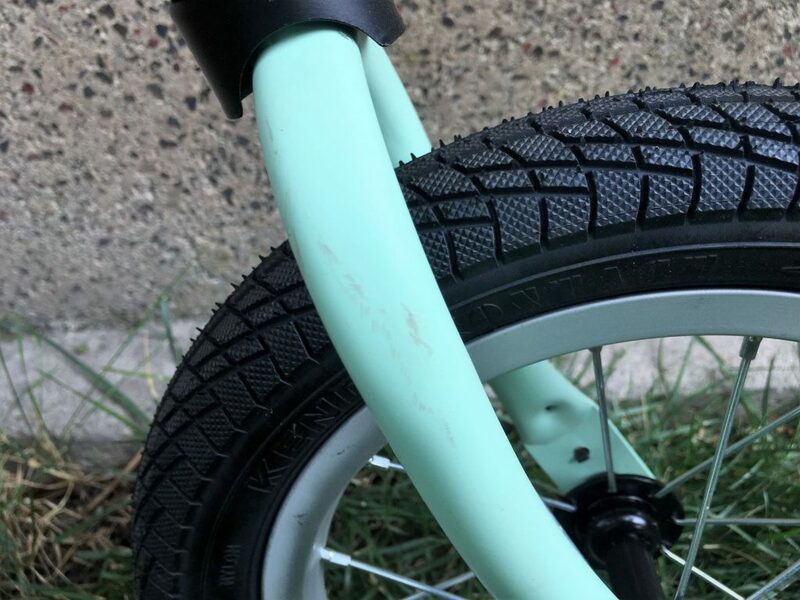 Not only does this save the soles of your kiddos shoes, but it also allows them to begin practicing operating a handbrake so it’s not something new when they transition to a pedal bike. 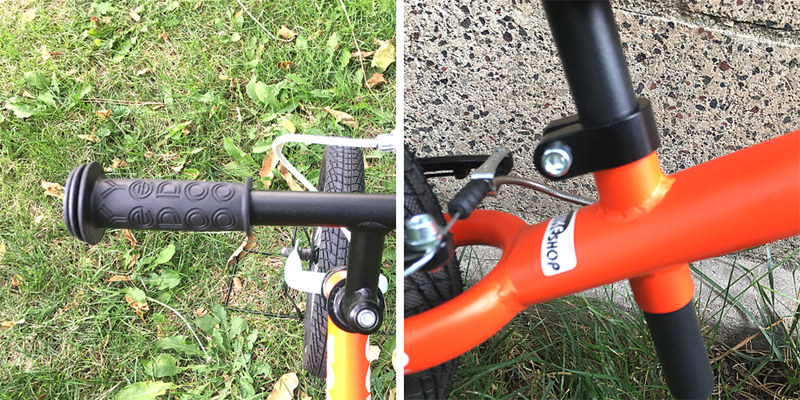 The Tektro-brand brake lever on the Yeddoo Too Too is size-appropriate for toddlers, and our 3-year-old tester had no problem pulling and activating the rear brake. 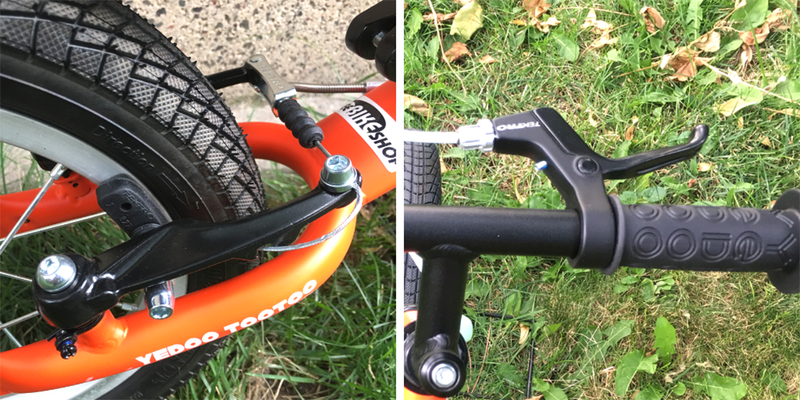 The other thing we appreciate about the Yedoo Too Too is the fact that handbrake operates a rear v-brake (rim brake) rather than a drum brake that you’ll find on many cheaper balance bikes, like the Enkeeo. Did I Mention That It’s Pretty?!? Ok, I had to make myself sound like a serious reviewer, so I put off mentioning this sooner. The thing I like best about the bike is the way it looks! It’s SO PRETTY. In fact, all the color schemes in the collection are pretty, and the brake cable housing matches too. The design of the bike also looks really sleek, so it makes a good gift for design-conscious parents. Unfortunately, I do have to mention that the paint started getting scuffed up a little sooner than I would have hoped or expected. For the first week or so that we had the bike it only got ridden inside the house. (Yes, bike riding inside the house is allowed in our family, don’t judge). That’s why I was surprised after a week of testing, to discover that the paint on the fork was already scuffed up. Of course, this could be the result of overly-rambunctious boys but was worth noting nonetheless. 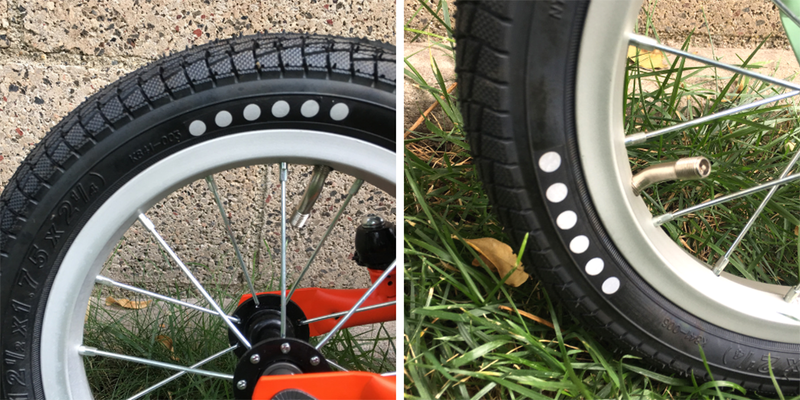 All of our favorite balance bikes have pneumatic (air) tires. You wouldn’t buy a grown-up bike with foam tires, so why would you buy a balance bike with them? Pneumatic tires provide much better traction–especially when riding on grass and gravel. And if you don’t think your toddler is going to ride off-pavement, you haven’t been a parent long enough yet. Toddlers and preschoolers ride EVERYWHERE. Like don’t turn around because they’ll ride their bike down the slide. Of course, the one downside to pneumatic tires is that they can and will go flat at some point. Still, the added safety and performance of air tires outweighs any maintenance inconvenience. And when the tires do get low or flat, check this out: the bike tubes have angled valves! Balance bike wheels are so tiny, it’s normally awkward to get the pump on the valve, but on the Yedoo Too, the angled valves make it a cinch! Finally, I’d be remiss not to mention the reflective dots on the sidewalls of the tires. This is something unique I haven’t seen on many bikes and will help keep your child visible when riding outside in twilight hours. The grips have decently large ends on them, so you don’t have to worry about little hands slipping off. The bike does NOT have a quick-release seat post collar. Given that everything else on the bike was so thoughtful, we found this a bit disappointing. You can always buy one as an accessory from Wee Bike Shop (and they have some cute, colorful ones), but really, this should be standard. 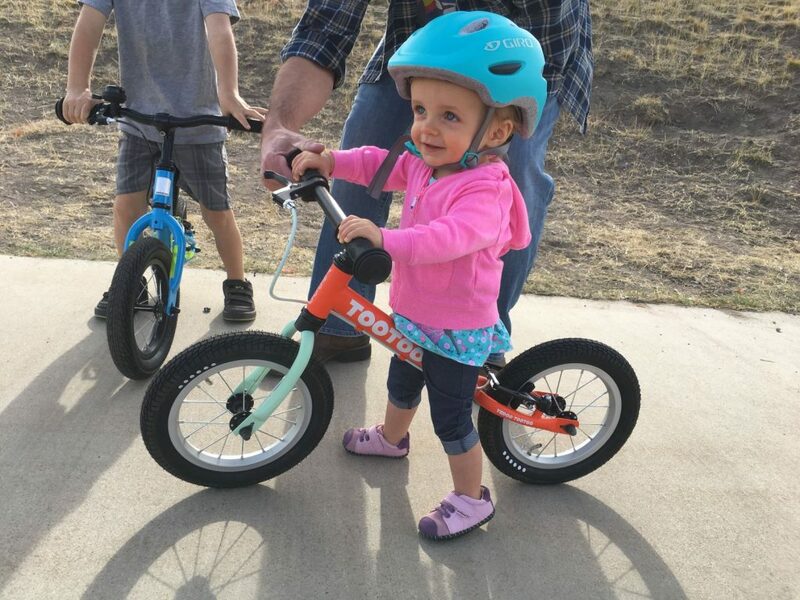 Considering toddlers grow faster than any other age group, you’re going to be constantly raising the seatpost. Without a quick-release, you have to go search for an Allen key each time you want to adjust it. The bike has a built-in steering limiter. This keeps kids from over-rotating the handlebars which is important for kids just learning to ride. That said, we prefer balance bikes, like the Woom 1, that has a removable steering limiter. Once kids have good coordination, you can remove the limiter to give kids full range of motion when steering. 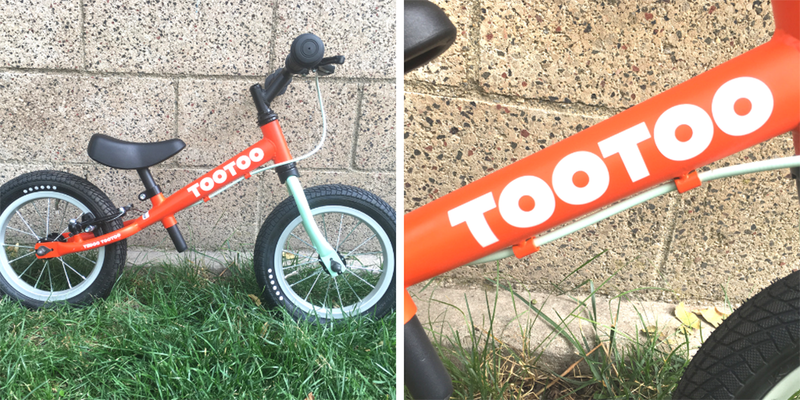 Although the Yedoo Too Too is well suited for young toddlers, there are a few balance bikes out there that have even lower minimum seat heights. 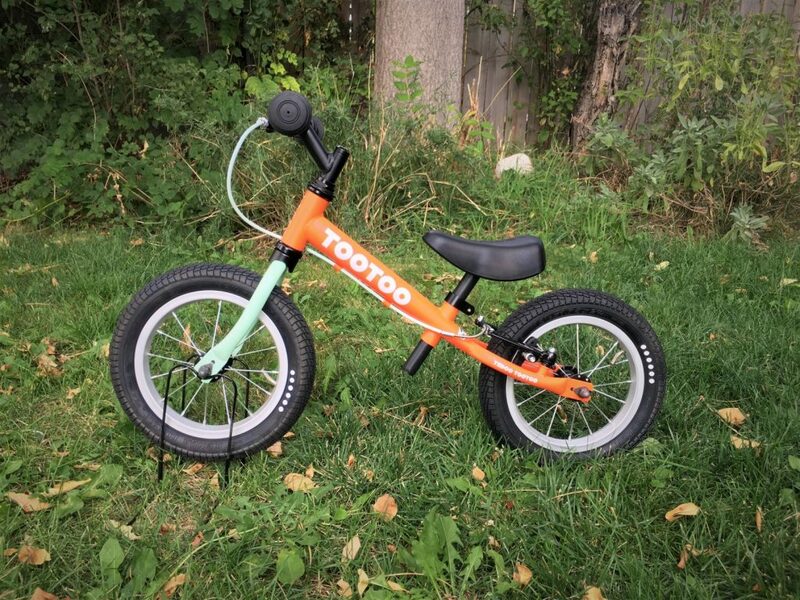 The Frog Tadpole, for instance, has an incredibly low minimum seatpost height of 9.5.” If your toddler does yet have the required 12″ inseam for the Yedoo Too Too, you might want to consider the Frog Tadpole or Woom 1 instead. With that exception, the Yedoo Too Too is a top pick in the toddler balance bike category. It is more affordable than some of the other top end balance bikes (Islabikes Rothan, Woom 1, etc), but offers similar brand-name components and a lightweight build. And compared to cheaper balance bikes like the Strider Sport, well, there is no comparison…..
Here’s a comparison chart for the Yedoo Too Too and what we would consider it’s closest competitors. 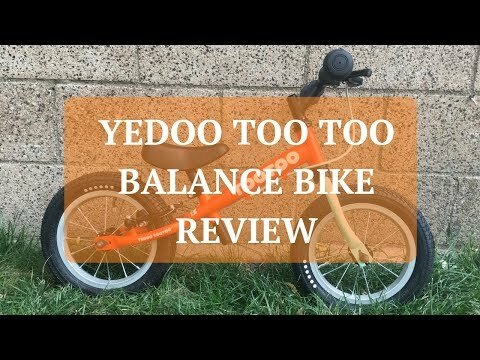 The Yedoo Too Too is a high-quality balance bike for young toddlers. Thanks to the low minimum seat height and lightweight, even the youngest riders will be able to manage the bike. Bike lovers will appreciate the brand-name components, and design lovers will gravitate to the attractive color palette and clean lines. And kids? Kids will love the Yedoo Too Too because it’s FUN.